In accordance with the HC order, one district in Delhi has successfully skilled its identified manual scavengers, each person was given a certificate along with an offer letter and a stipulated salary. 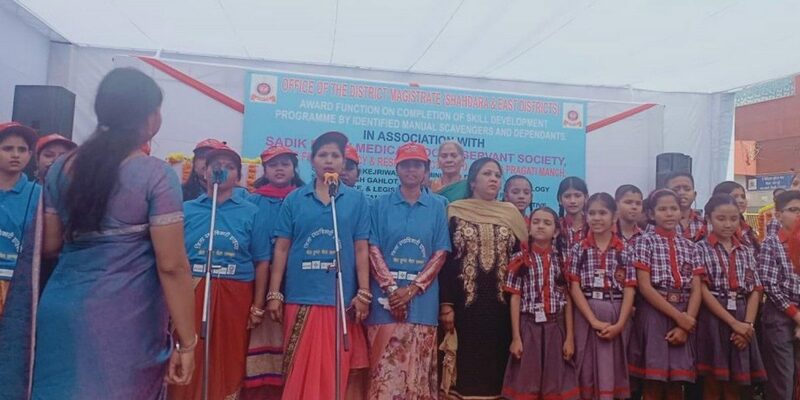 New Delhi: On November 7, 34 manual scavengers in the district of Shahdara celebrated the successful completion of a three-month skill development programme, meant for manual scavengers. Last month, The Wire reported that the Delhi high court had passed an extensive and detailed order on the identification and rehabilitation of manual scavengers in the city. On Tuesday afternoon, the class of 50 assembled in the district collector’s office complex in Nand Nagri to be felicitated by Delhi chief minister Arvind Kejriwal, reported the Indian Express. The identification of manual scavengers in Delhi began a year ago after the Supreme Court in Safai Karamchari Andolan & Ors vs The Union of India & Ors created a mandate for all the states to implement the provisions of the Prevention of Employment as Manual Scavengers and their Rehabilitation Act, 2013. District magistrate (Shahdara and East) K. Mahesh stated that the process of identification resulted in the survey finding a total of 45 manual scavengers – 28 from Shahdara, nine from the east district and eight from the north east district. Of the 45 identified, 34 adults joined, while another 16 dependents were also included in the programme – making up a class of 50. According to the high court order, the 45 persons identified as manual scavengers are to be recognised under the 2013 Act and to be provided with one-time cash compensation and skill training. Additionally, the children of those identified are also to be provided with skill training under the scholarship programme of the Act. In accordance with the 2013 Act, the class was trained in housekeeping and given employment letters by NGO Sadik Masih, reported the Indian Express. Classes were held on Monday to Friday from 2 pm to 5 pm at the collector’s office complex. The ‘students’ were taught how to use vacuum cleaners, make beds and clean rooms. Important lessons on how to use protective gear – helmets, masks, belts, gum boots and gloves – in hazardous work environments was also conducted. Upon successfully completing the programme, each person was given a certificate along with an offer letter and a stipulated salary – ranging from Rs 12,000 to 16,000 a month. According to NGO head Vinay Stephen, the top three graduates will will be made supervisors of night shelters, while the rest will be employed as caretakers and housekeepers. For many graduates, this was a momentous occasion as just a few months ago, most of them were cleaning sewers, despite the practice being banned in the country. A report by the Delhi Legal Services Authority (DLSA) submitted in August 2016 stated that 233 persons were willing to identify themselves as manual scavengers in Delhi as a whole. However, while congratulating the graduating batch on Tuesday, Kejriwal complained about the lack of cooperation from the MCDs in identifying manual scavengers. Most of the survey committees constituted to identify manual scavengers in the 11 districts of the city are reportedly still inactive. “I am happy […] to see that after training, there are jobs too. But how can there only be so few manual scavengers in the city?” he said, reported the Indian Express. The case in the high court is being treated as a continuing mandamus. The bench will hear the matter on November 26.